Bored of your old swim cap or need a new one? Renew your swimming equipment with SwimElite’s double-sided fashionable swim cap. With one color on the outer side and another one on the inner side, you can instantly switch to a completely new model just by turning it on the other side. 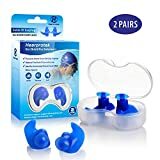 You basically get two different durable swim caps for the price of one. A premium silicone cap is so durable that it will last you for years, but it can get boring after a while. With the SwimElite swim cap you can never get bored. Why choose a premium 100% silicone swim cap? – Lightweight, you barely feel you are wearing it. – Specially designed to protect the ears and to reduce drag. Created with the most durable and comfortable silicone, this reversible swim cap is engineered to increase speed by massively reducing drag. 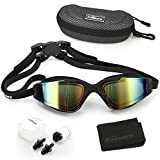 It’s used by professional swimmers who spend a lot of time in the water and need full protection from the chloride and other substances in the pool. – Easy to put on and take off. – Fashion statement. Use it on both sides, depending on your mood. CLICK THE “ADD TO CART” BUTTON NOW TO GET THIS UNIQUE SWIM CAP! PERFECT GIFT FOR SWIM ENTHUSIASTS! HURRY! Discounted Stock is Limited! 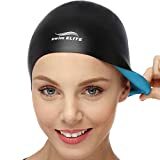 Buy with confidence: We have thousands of Happy Customers and the best rated swim cap on Amazon! TWO DIFFERENT USABLE SIDES. Each side is of a different color and you can wear it on either one. MADE TO SLIDE ON EASILY AND STAY ON without snagging your hair. Designed with a precision fit for reduced drag and tear resistance. FASHIONABLE, Eco-friendly & Odorless. Allows you to SWIM FAST due to the premium silicone that reduces drag. Suitable for both adults and youths. LIGHTWEIGHT & DURABLE. Protects your ears and hair from bacteria, chloride and other substances in the water. COMES WITH A FREE BONUS PROTECTIVE BAG that you can take anywhere. This way, your swim cap will last for years.